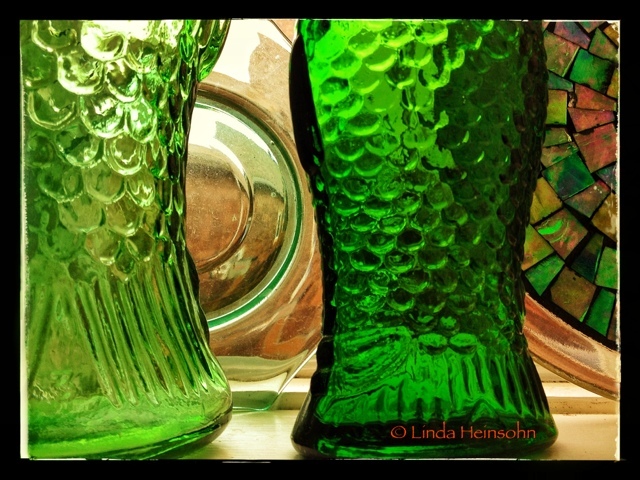 Glass fish bottles, a plate and a window ornament on the kitchen window sill at dear, sweet Flotsam. I've been trying to take this photo for several years but have never been satisfied with what I've come up with. Today, it struck me that perhaps I've been trying to photograph too much. I'd been trying to make compositions out of the whole window scene, or else use various components in "arty" arrangements. Instead, I found what I was loving was the just overlap and intersection of the various glass colors, textures, and their placements on the sill. In making today's photo composition and then cropping, adjusting color intensity, light, etc., I found another element that's called to me but, until I found Snapseed (that almost perfect ipad app), I couldn't bring out. That missing color element was the rich brown of the neighbor's shingles. Once I was able to enrich that element, the minimal composition really started to sing to me. I hope it sings for you, too. April 20: Tried this composition, cropping out the left side so you can only see the hourglass shape of the glass bottles. Rule of thirds, you know. I'll need to look at the two for comparison for awhile to see if I think this one is "better" or not. I like how you created four vertical "stripes" running across the horizontal frame. 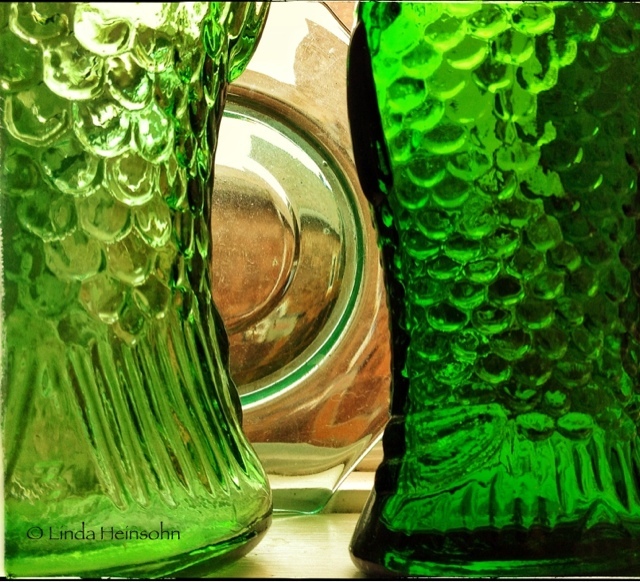 The luminous quality of the glass is rich and jewel-like. Thanks, Carol. I made an update of the photo by cropping it to just three vertical stripes just to see if I like it better. Been thinking about your four stripes of texture or sand on the beach where the second one from the left was different. I thought yours was refreshing, a kind of theme and variations photo. I could be wrong here with mine, but I think I still prefer the four stripes photo over the three stripes. Though that hourglass shape is very compelling.